How can anybody not love BOHEMIAN RHAPSODY!?! I danced in my seat with a grin spread clear across my face. I didn’t want this two-hour bio-pic about the legendary British Rock Band QUEEN and its lead singer Freddie Mercury to end. I sat through the credits! Now I have alternating ear worms of Another One Bites the Dust and We Will Rock You! But that’s a good thing. It brings me back to the fabulous music of the ‘70s! The story focuses on Freddie Mercury (Rami Malek). Born Farrokh Bulsara of Parsi (Zoroastrian) descent in Zanzibar, self-named Freddie moved with his family to Middlesex, England in his late teens. In the 1970s, he formed the band QUEEN along with Brian May (Gwilym Lee), Roger Taylor (Ben Hardy) and John Deacon (Joseph Mazello). As the flamboyant Freddie Mercury with a four-octave vocal range, QUEEN soared to the top of the music charts over, and over, again. The movie BOHEMIAN RHAPSODY touches on Freddie’s supportive relationships with his then girlfriend Mary Austin (Lucy Boynton), the creative energy he shares with his band mates, his father’s disapproval, and his struggle with coming out as bisexual and then gay. Freddie is smart, funny, charming, talented, daring, and emotionally insecure. When offered an opportunity to sign a solo contract for a lot of money, Freddie goes for it. He is taken advantage of by his second manager, indulges in drugs, and alienates everyone who loves him. 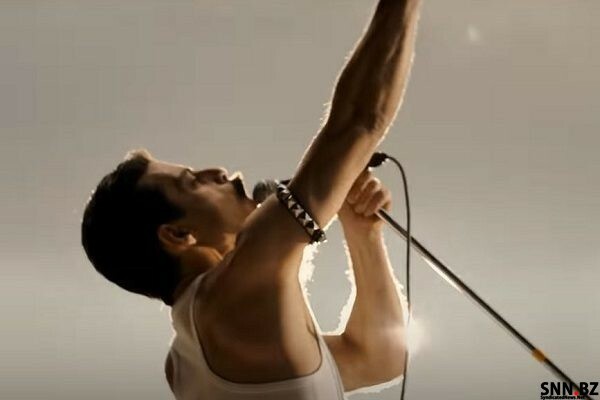 BOHEMIAN RHAPSODY takes us up to 1985, when QUEEN is asked to join the roster of top performers at the Live Aid Concert just as Freddie is diagnosed with AIDS. What makes this Movie great is that it ends on a high note with Freddie redeeming himself with everyone, even getting a hug from his father. BOHEMIAN RHAPSODY then takes the audience to the Live Aid Concert, a once in a lifetime spectacular fund-raising music event starring the super Rock Bands, including QUEEN with Freddie Mercury at his very mercurial best. Stewart Stewart and I (Dena Stewart) loved BOHEMIAN RHAPSODY and the fabulous transformation of Rami Malek into the iconic Freddie Mercury … although we both agree that a little more story – some background of the other band members and their lives outside of QUEEN, would have made this movie a 5-mustache rating.